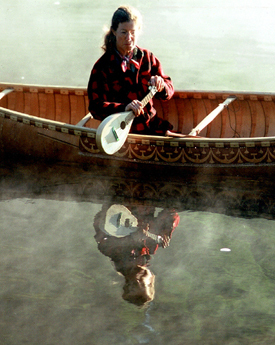 The ukulele has had a long and close association with the canoe, both in summer and song. The PADDLELELE combines the best attributes of a canoe paddle and a ukulele in a single implement. Made from ash, the traditional timber for paddles, the neck and body are cut from a single piece of wood, with a quartersawn top and back glued to the rim. 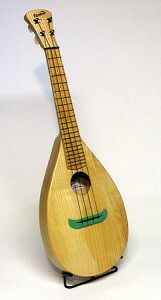 A thin green veneer is glued around the sound hole, and under the fret board and headstock, with a matching green canoe-shaped bridge. The PADDLELELE is loud enough to be heard over a waterfall, with a tone as bright and clear as the full moon. Don’t be caught up the creek without one! Note: the PADDLELELE should only be used as a paddle in cases of extreme necessity, or photo opportunities.